CITE AS: John Layt, "Overview of Apps & Plugins software development project," in 100 Minories, March 16, 2015, https://100minories.lparchaeology.com/overview-of-apps-plugins-software-development-project/ [Date Accessed: April 23, 2019]. Screenshot of the ‘ArkScan’ App in Alpha development stages. Screenshot of ‘ARKPLAN’ showing output of the ‘Plan Tool’. Screenshot of ‘ARKPLAN’ Georeference tool – tool to lay-out a local grid and convert co-ordinates between local and national grids. The 100 Minories project is developing a set of GIS standards and software to support the Museum of London Single Context Recording system. Click here to read about the background and rationale to this project. The software is nearing the end of Alpha and will soon be released as Beta software for wider testing. Listed here is a description of each standard and software currently being developed by this project, as will as its development status. A set of standards defining how to store archaeological context planning data in a GIS. The tools developed will adhere to this set of standards, but some flexability is to be provided for variations in naming standards, storage locations, and symbology. Status: In draft stage, evolving as the tools are ready and processes are tested. A set of training materials to teach the end-to-end process, including a manual, tutorials and screencasts. 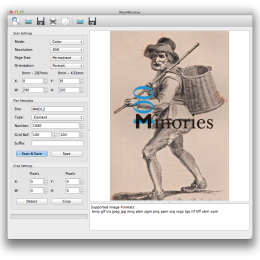 A photo management app that can query ARK to determine what photos in the archive have and haven’t been registered, allowing the data to be better managed. A standalone application to scan drawn plans and save them with embedded metadata to allow automated georeferencing of the plans. You can enter your site code, plan type, context number and grid reference for the plan you are scanning. It is designed to be easily used by field staff. It also provides the standard scanning tools for office use. 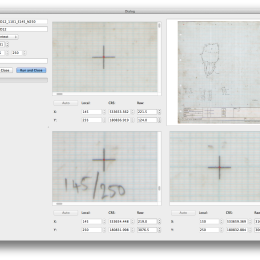 Status: The plan scanning tools are complete, but metadata is only encoded in the filename and not yet the EXIF data. Standard scanning functions are not fully completed. The tool only works with scanners using either the TWAIN-SANE drivers for Mac [http://www.ellert.se/twain-sane/], or SANE [http://www.sane-project.org/] installed on Mac or Linux through other means. A generic WIA/TWAIN interface for Windows/Mac is planned. Requirements: SANE for scanning, ImageMagick for auto-crop. A QGIS plugin implmenting a set of tools to assist with the digitising and analysis of archaeological site plans. Site Wizard: A first-run wizard to set up the GIS files and grid required for a new project. Grid Tool: A tool to lay-out a local grid and convert co-ordinates between local and national grids. Georeference Tool: A tool to automatically georeference drawn plans to the local grid or baselines. 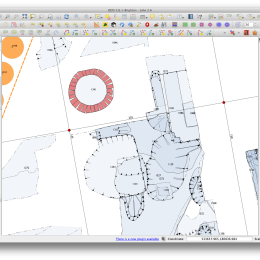 Plan Tool: A tool to digitise the georeferenced drawn plans. Survey Tool: A tool to import survey data, e.g. from a TotalStation, and automatically add to the context data based on the ID and Code. Filter Tool: A tool to filter what contexts, sub-groups, or groups are displayed, and to query the data held in ARK. Status: Grid co-ordinate conversion, semi-automatic georeferencing to the grid, plan drawing tools, and context/sub-group/group based filtering have been implemented. The site wizard, grid creation, fully-automatic georeferencing, survey tool, and live query of ARK data are not yet implemented.